The Wilderness (also known as the "wildy" or "wild") is a very dangerous place. It is the only place in all of RuneScape that players are allowed to kill each other at random if the two levels are in range. This guide will help you to maximize your chance at staying alive and avoiding deathtraps. 84 mining - 85 Mining is required to mine Runite, however using a Dwarven Stout when you're at 84 mining will work. It is still recommended to get all the way to 85 mining before attempting to mine Rune though, as it simplifies things greatly. If you don't have 85 mining, you might want to check this out, to see if it's any help. Perseverance - Rune mining isn't a walk in the park, and you need to know what you're doing to be rewarded from it, so stick to it. There's nothing worse than putting all the effort in to getting 85 mining and then realizing it's not worth it. Unless you have a pure mining account (very low combat level) it's inevitable that if there are PKers present, you'll be attacked upon logging in at the Rune rocks. This is where scouts come into the equation. Having an extra account (or 2) allows you to log in at a safe location to "scout" out the world for Pkers and un-mined Rune rocks. If the coast is clear and there are free rocks, proceed to log in with your mining account and get to work on the ores. However if it's not, continue world hopping. It is an effort to go through Tutorial Island, but it is strongly recommended you do so, unless you're feeling lucky. This is because it allows you to see if there are un-mined Rune rocks and if Pkers are present, without being in any danger of being attacked. It's a little tricky to get there though, especially with a level 3 character, so be sure to bring some food. Also, there are parts of the maze that require you to slash through a web, and therefore a weapon of some sort (Dagger, Sword, etc.) must be brought with your scout. These parts are indicated with a green line. Because it is a F2P wilderness guide, all the items are for free players. Green D-Hide Body - Dragon Hide is a better option than Rune Armor as it is resistant to magic attacks, as well as ranged and melee. Holy Symbol - Assists prayer and is most effective against PKers. NB: If your prayer level is below 37, then it is probably more effective to bring an amulet of Defence rather than a holy symbol, as the extra help in prayer a holy symbol provides is wasted. Cape - Although this item doesn't help a great deal, it does help, and is almost worthless money-wise, so it is recommended. Boots - For the same reason as a cape. Rune Kite Shield (Optional) - Increases Defence by a great deal against melee and ranged attacks, and does not affect the magic attack resistance. This item is down as optional because some may not be willing to risk this item every trip - But it helps. Pickaxe - you can't mine without this! Note: If you're not willing to risk this much every time you go in search of Rune, you shouldn't even consider mining it. Food - Bringing a certain amount of food is mandatory when mining Rune in the Wilderness. However the amount of food taken is highly dependant on your combat level (Life Points and Defence Level). If you have a high combat level (100+), you won't require any more than 4-6 Swordfish/Lobsters. However if your combat level is much lower (Below 70), you may be required to bring up to 10 Swordfish/Lobsters. Runes - The second mandatory set of items that are to be carried, are teleport runes. 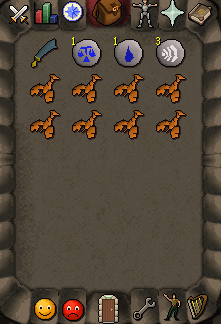 Falador runes (Being the closest major establishment) are the best choice. Scimitar (Optional) - Although this item is optional, it's a good idea to carry a Rune Scimitar. This is not to attack Pkers, but instead to attempt to kill any Rune miners that are of a lower level. Picking up the occasional inventory of Rune is always a welcome surprise. Dwarven Stouts - This is only required if you have 84 mining. Bring around twelve (12) stouts with you when mining. NB: Dwarven Stouts are highly unpredictable in effect. Some can last through several worlds, whilst others wear off before you mine one ore. They also drain your Defence, strength, and attack stats, which makes it all the more difficult to escape from PKers. Hence, it is recommended to simply get all the way to 85 mining. The added red line that does a loop through the Monastery indicates the re-fill of prayer points. It is essential that you have FULL prayer points before every single trip. You can also use the monks there to heal yourself, meaning you don't need to waste extra lobsters getting your health back up to full. Hopefully this is the only path you'll ever have to take, but in the unfortunate circumstance of a PKer attack, continue reading. Player Killers are the bane of the Rune miners' existence. Upon being attacked by a PKer, you must always activate the appropriate prayer. If this is not done immediately, you may suffer from several big hits before you've had a good chance to run. It's a good idea to try to get out of the range of the melee PKer so you can use either a ‘protect from magic' or ‘protect from ranged' prayer, totally eliminating swordplay. When you log in, always click on the ‘run' option, so that if a PKer appears, it is easier to click and run. Alternatively, you can hold control as you run. Make sure you have the ‘auto retaliate' toggle off. This prevents your character from accidentally attacking the PKer, wasting escaping time. If you do manage to escape, NEVER come directly back to the Rune rocks. It's far too risky and will rarely pay off. Always go back to the bank, recharge prayer, recharge energy, restock food, and regroup. This is a good option when you have 100% energy, and you have a light inventory (Not many ores). If this is not the case, the methods below are the ones that should be taken. The general aim of this method is to 'lose' the PKer, allowing you to log out safely. To be able to log out, your character must be out of combat for 10 seconds or more, hence it is essential that you lose them by hugging trees or rocks. 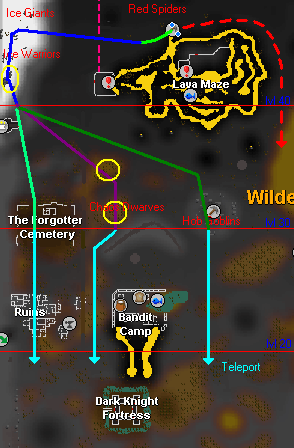 Below are some alternate paths that can be taken upon being attacked by a group of PKers. Note that the yellow circles indicate prime spots to hug rocks or trees, and that to the left of the vertical dotted pink line is all Single-Combat Wilderness area. Lime Green line - This represents the first attempt at distracting the PKers. It is the run through the 'Deadly Red Spiders', and with any luck you will be able to safely log out after running through. Blue line - If you do not succeed in losing your tail, continue running along the path of the blue line through the 'Ice Giants' and 'Ice Warriors'. There are also some rocks near the end of the blue line that can be used to 'trap' the PKer behind, and proceed to log out. By the time you are at the intersection of the Dark Green, Light Green and Purple lines, you should have hopefully lost the group of PKers. Light Green line - However, if this is not the case, all is not yet lost. Following the Light Green path is one of 3 options still available to you. If you are low on energy, or there is only a small group following you, this is your best option, as it is the most direct way to level 20 Wilderness. There are also Skeletons and Ghosts in this cemetery, allowing the possibility of distracting the PKers through these NPC's. Purple line - This is another viable option. This is a good option if there are a small group (i.e. 2-3) PKers following you. 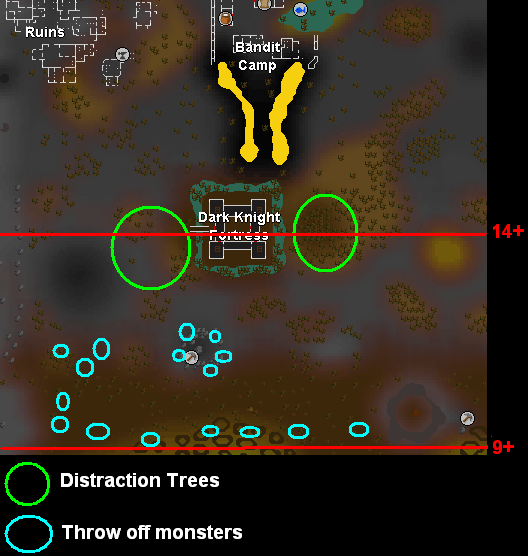 There are two good spots to closely hug the trees along this line, and thus it is possible to 'trap' the PKer momentarily behind a tree and safely log out. If this does not prevail, then there are still Chaos Dwarves to distract the PKers, allowing another method of escape. If none of this works, running to level 20 Wilderness and Teleporting is your next move. Note: If running along the cyan line at the end of this line, be sure not to stray too far East, as the area directly next to the Bandit Camp is Multi-Combat Wilderness. 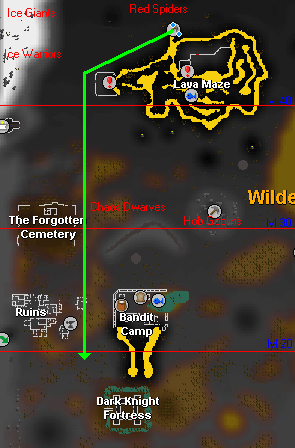 Dark Green line - This is your best escape route if there are more than 3 PKers. However, if you have exceedingly low energy (possibly from a full inventory of Rune), it's still better to take either the Purple or Light Green line. The Dark Green line will waste the most energy, as you cover the most ground, but it is best for larger groups as the Hobgoblins and energy use will throw off the majority of the PKers. If you still have a tail after this, run down to level 20 Wilderness and Teleport away. Dotted Red line - Never take this line. The line simply leads into Multi-combat Wilderness area, in which there is a very slim chance of survival. Always be alert when mining - Be sure to be constantly checking the mini-map and looking for white dots. If you see one, it's a good idea to instantly log out and log back in with your scout to see if the character is a danger. But if you're willing to risk it you can stay on your mining account to get a glimpse of the white dot, then make your decision. If you see a low level character quickly log in and then out, be VERY careful. It's most likely a scout of another miner, and if that miner is a higher level than you, you may be attacked. Don't become discouraged - At times it's hard to find free ores, but just keep at it and sooner or later, you'll get on a roll of 4 or 5 worlds in a row with un-mined ores. Collect your ores in large amounts. Meaning don't sell them as soon as you mine then. If you can accumulate 500 ores, people will be willing to pay more for each individual ore than if you sell 10 of them. This is just a guide, and so you don't have to follow it too closely. If you do something different that works for you (different armour, food, methods etc.) then by all means continue doing so. 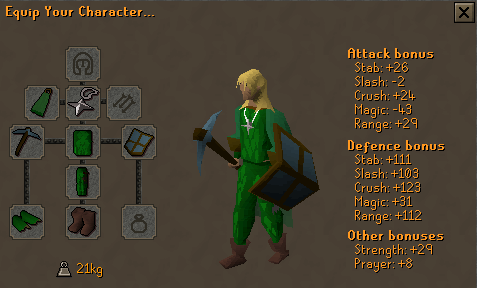 The most important thing to keep in mind whilst mining Rune, is to use your own discretion. Completing the Mage Arena enables you to use God spells such as Saradomin Strike, Claws of Guthix and Flames of Zamorak. As it's rewards are useful, it is also equally deadly. Most people would rather take the risk of using the Wilderness lever to teleport them from Ardougne. This way, although faster, can get you killed much easier. You will be teleported to the Deserted Keep in the Wilderness. Once there, you might want to get into the Mage Arena as quickly as possible unless there's a PKer team lying in ambush there. If you ever get caught by PKers, here's a route to get you to safety. This route will bring you to non multicombat. If possible, bind the PKers that are following and log out, if not, continue running. 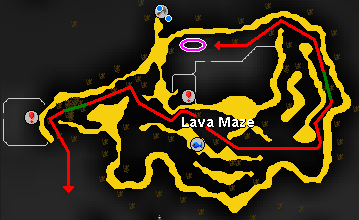 This route will use the least amount of energy and still may throw the PKer off by the gate but your chances of getting killed are high. Use your Bind spells on PKers to stop them. It's foolish to go to the arena with under 80% of your energy. If you get attacked by PKers and manage to get away, wait for your energy to recharge before returning. PKing in this category mostly range from level 2 up to the max teleportation point: 20. This is an easy way to get away; just teleport or run using trees at your advantage. But there's a caution, people tend relax in low level wilderness not realizing that there are spells that could kill them before they actually teleport or block their teleportation. 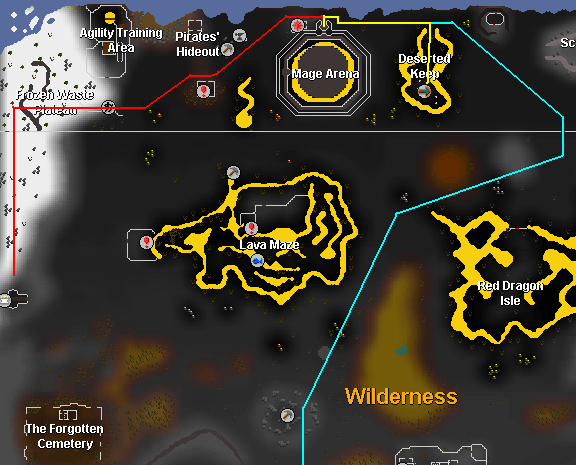 The 2 main places where people PK are, The Varrock wildy leading up to the Giants or the Edgeville wilderness leading up to the Dark Warrior's castle or Bandits Camp. 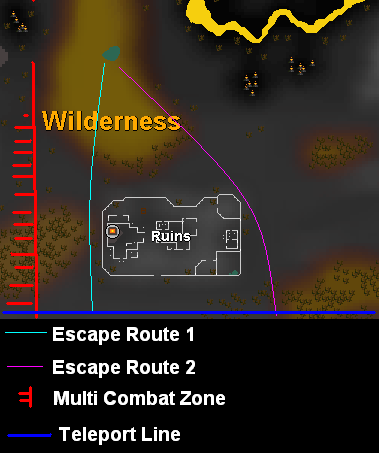 This Wilderness is favored by single PKers as it only partially in multi-area combat. In level 1 to 10 wilderness, it is easy to get away from PKers as long as you have run or prayer. After level 10-20 Wilderness, although people still carry teleportation, there are trees that can actually be more beneficial rather than using teleport. Also, the cyan dots indicate that there are NPCS that can throw off pkers. This is the most dangerous low-level Wilderness as it is in multi-combat area. Dangerous no doubt, but there are many escape routes that you can take without using teleport. 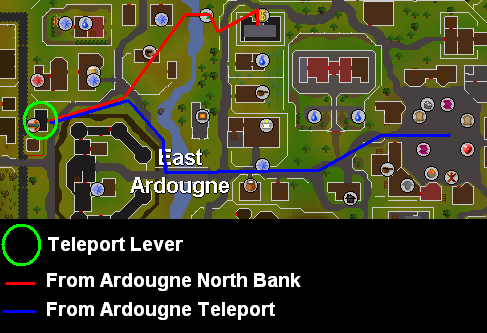 From level 1-6, it is pretty simple; either you run south to Varrock's north gate or if you're getting teamed, teleport. But it is in multicombat Wilderness so don't underestimate teams here. Giants - Located in level 12 to level 17 Wilderness. Although it is in multi, there is a massive patch of dead trees (shown by the yellow circle) to help you throw off multiple attackers. 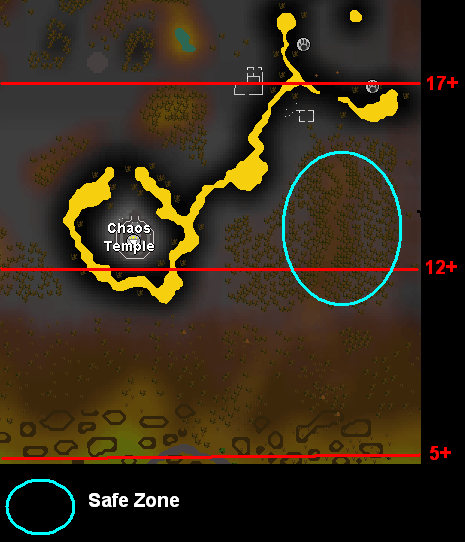 If you get attacked by the area surrounding the circle, run into the yellow circle and log out or if the attacker have chopped off his attack, walk back to Varrock wildy. Don't underestimate the Varrock Wilderness, it can be more deadly than high-level Wilderness. People do die in low-level Wilderness. This category is the most dangerous, but if successful, the rewards are worth it. High level pking goes from level 20 wildy and above. PKers kill people at high levels near the Greater Demons, Rune rocks or Moss Giants. The line nearest to the top indicates that there are trees in the area that you can get away from. Teleportation isn't really needed in this level of Wilderness. If you happen to see a clan there, run east, then down to the Chaos Dwarfs to lose the PKers. Do not follow the cyan colored line, it will only lead you to multi area where you chances of getting killed is high. 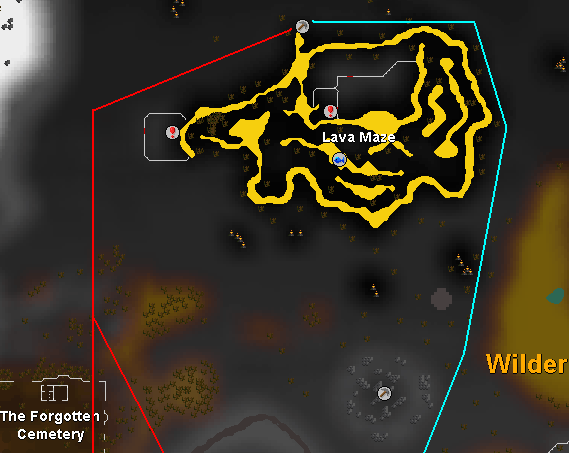 Instead follow the red colored line and lose the PKers at the Ice Giants or at the Chaos Dwarfs. This is a very dangerous place to go to as it is in multicombat, 44+ Wilderness and the nearest non-multi area is about 10% of energy run. 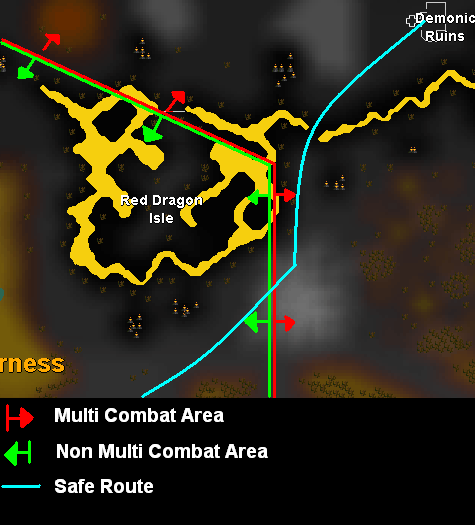 There isn't any way that you can run away from PKers at the Greater Demons but I recommend running to non multi area first so you can actually survive until level 20 Wilderness. Follow the yellow line along the way. It is beneficial to have a reliable mage team. Binds can be used at a defensive spell. If you're being attacked by a clan in the Demonic Ruins, either your mage partner binds the attackers or if you're a mage yourself, do the same thing. In the event of a clan attack at the Demonic Ruins, attack the mage in the clan first. They are deadly in later stages of the fight. I do not recommend using teleport Runes unless it is totally necessary. It is not only cowardly, but it can be a mistake for you in high level Wilderness. Don't be foolish by running after a target that you will know you can never catch. You will waste energy and that energy that you have wasted may be useful in a life or death situation.